I discovered Libochovice Chateau in 2005 and wrote about it in an article describing chateaus in north Bohemia. It was published during October of that year in The Washington Post. Libochovice is certainly a hidden gem in north Bohemia. I recalled its dazzling displays, stunning tapestries, breathtaking ceiling frescoes and beautiful tiled stoves plus exquisite jewel chests. It is a shame there are not more foreign tourists making the trip there. It has so much to offer the curious castlegoer. Before entering the chateau courtyard, I peered at the statue of Jan Evangelista Purkyně, who was born in Libochovice during 1787 and who became one of the leading scientists in the world, as he delved into the studies of anatomy and physiology. His father had worked for the Dietrichsteins, the family who had owned the chateau at that time. 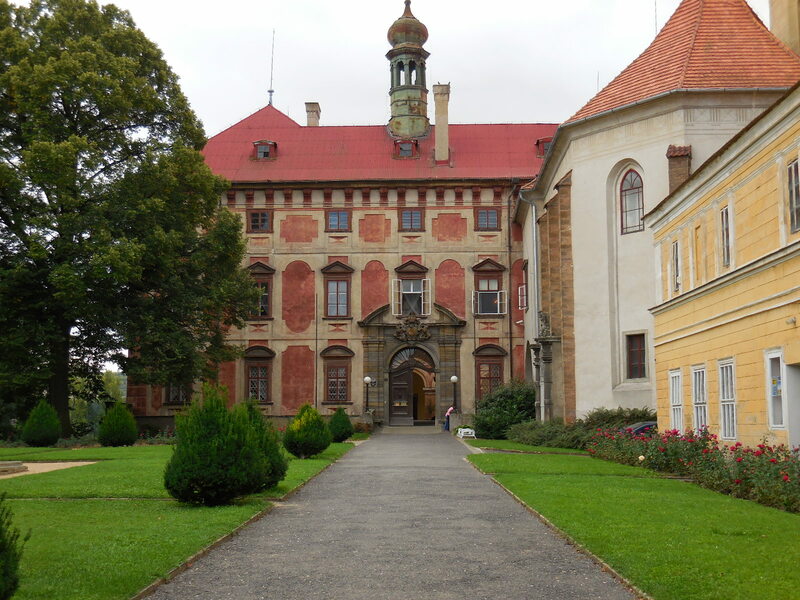 For two years Purkyně served as a tutor at Blatná Chateau, a remarkable sight in south Bohemia. 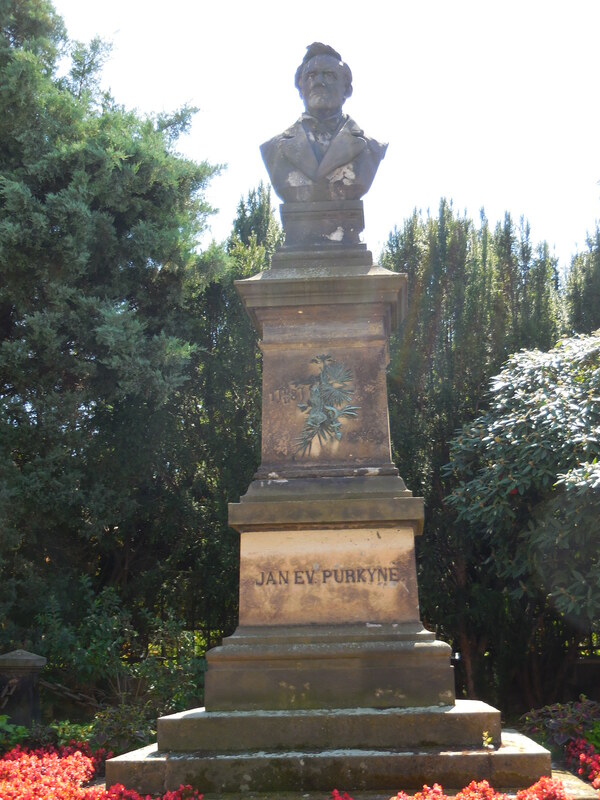 Later, he made numerous discoveries in the scientific sphere, such as the Purkinje effect, Purkinje cells, Purkinje fibers, Purkinje images and the Purkinje shift. He also coined the scientific terms plasma and protoplasm. A crater on the moon and an asteroid are named after him. Before my trip, I had read up on the history of the town and chateau. Located near the romantic ruins of Házmburk Castle, Libochovice was first mentioned in writing at the beginning of the 13th century. 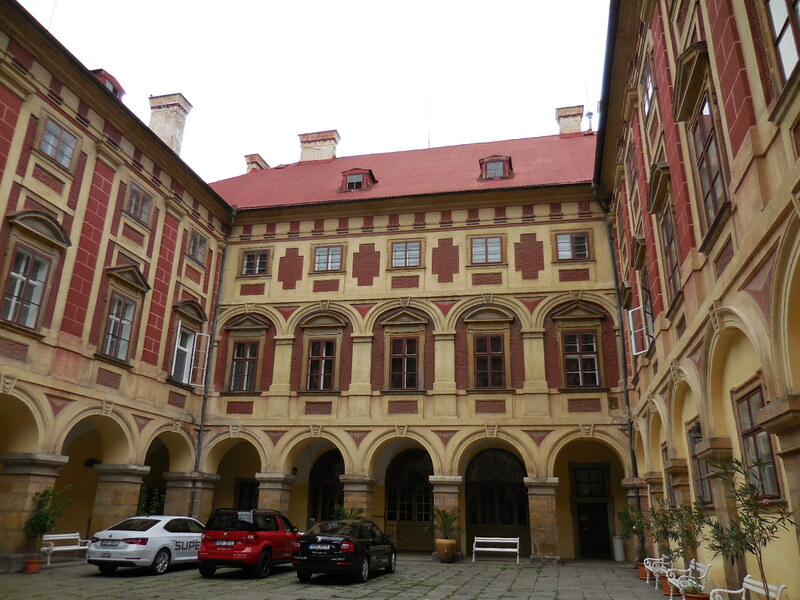 At that time, Házmburk Castle, then called Klapý and by no means a ruin, played a major role in the development in the town. A wooden fortress was built in Libochovice, and it was later replaced by a stone Gothic structure. During the Hussite Wars of the 15th century, the castle in Libochovice was razed, the town conquered. 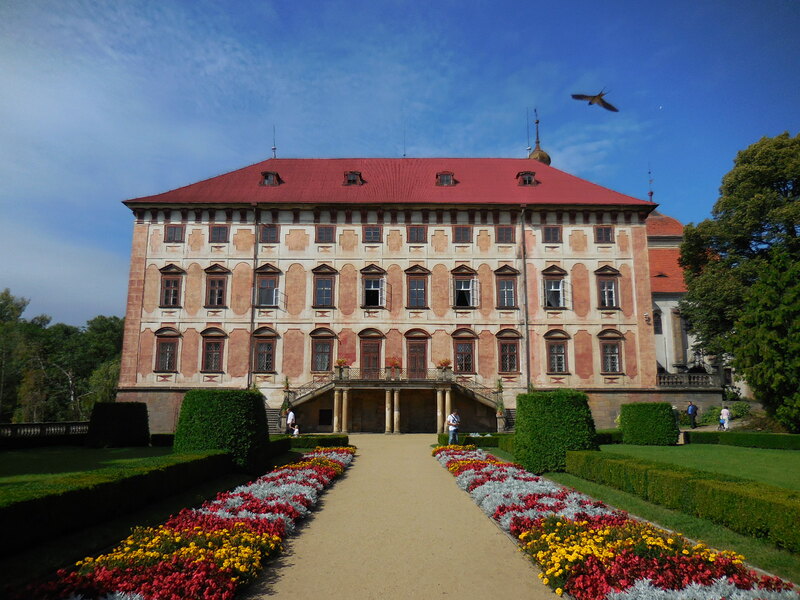 The Lobkowiczs took over the properties in 1558, and they were responsible for constructing a Renaissance chateau with 28 rooms on the premises. When Jiří Lobkowicz revolted against Emperor Rudolf II in 1594, he was imprisoned, and his property was confiscated. That’s when the Sternberg family took control. Still, times were not rosy. The Thirty Years’ War did much damage, and during a fire in 1661, the chateau was destroyed. When Václav Vojtěch Sternberg sold Libochovice to Austrian noble Gundarkar from Dietrichstein in 1676, a new era had begun. The Dietrichsteins would retain ownership until 1858. The chateau was reborn from 1683 to 1690, designed in early Baroque style. There were four wings with a courtyard decorated with Tuscan pilasters and arcades. A sala terrena on the ground floor led to the garden. Unfortunately, Gundakar died before the construction of the two-floor structure was completed. 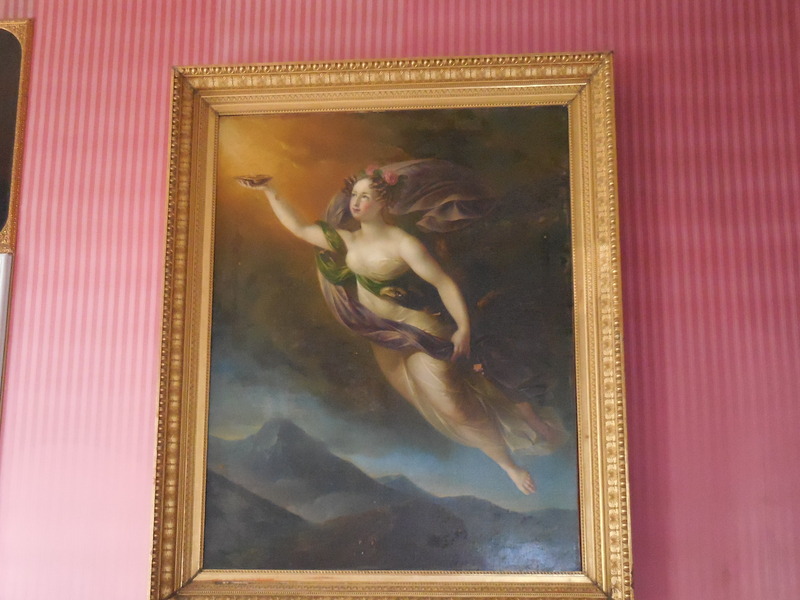 His daughter Terezie was then in charge of the chateau, and she had renovations made in the 1870s. More reconstruction occurred from 1902 to 1912. In the 19th century Johann Friedrich Herberstein added many objects of interest to the chateau collection. An avid traveler, he toured Egypt, Syria, Persia and India, for instance. During World War II the chateau’s history was bleak. That’s when Nazis took over Libochovice Chateau. Sixty-five residents of the town and surroundings revolted against the Third Reich and were beheaded by the Nazis. After 1945 the chateau was confiscated and nationalized because wartime owner Friedrich Herberstein had obtained German citizenship. More reconstruction took place throughout the decades, and in 2002 the chateau was declared a national monument. I was so excited about this tour. 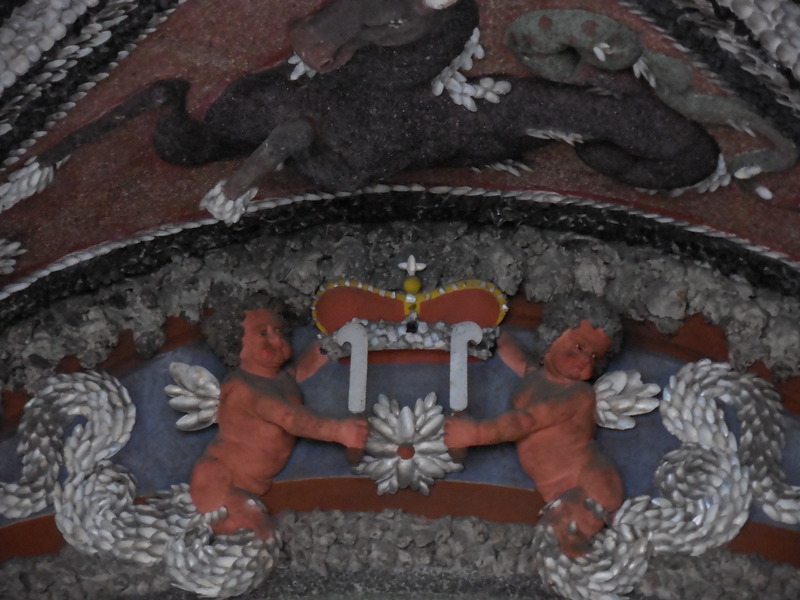 First, we visited the sala terrena, which looked like a richly adorned cave. The vaulted ceiling was incredible. I loved the sea motif as decorative seashells took the shape of a floral design. The reliefs of a sea monster also enthralled me. Next, we came to one of the highlights of the chateau, large Saturn Hall, where banquets, balls and concerts had been held. Above the fireplace a stucco sculptural grouping focused on Saturn. The Baroque chandelier, hailing from Holland, also captured my interest. 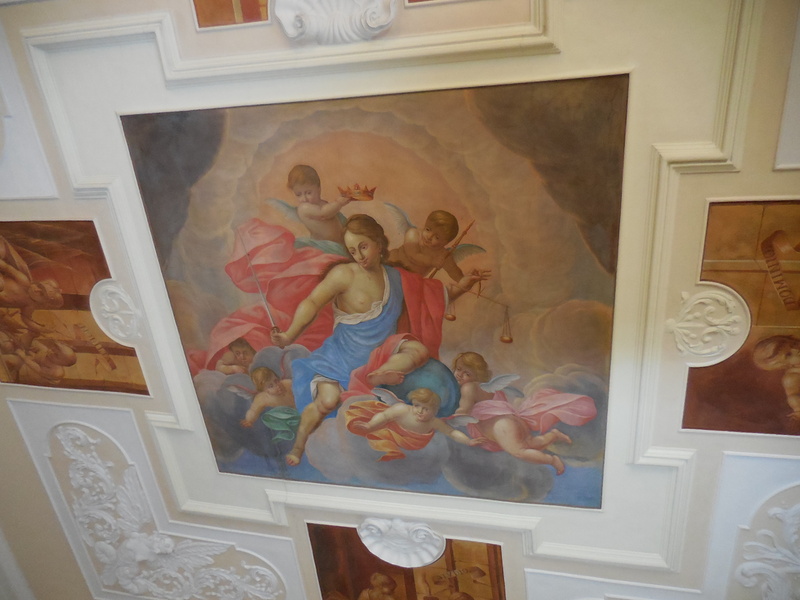 From there, we continued to the Baroque section of the chateau. 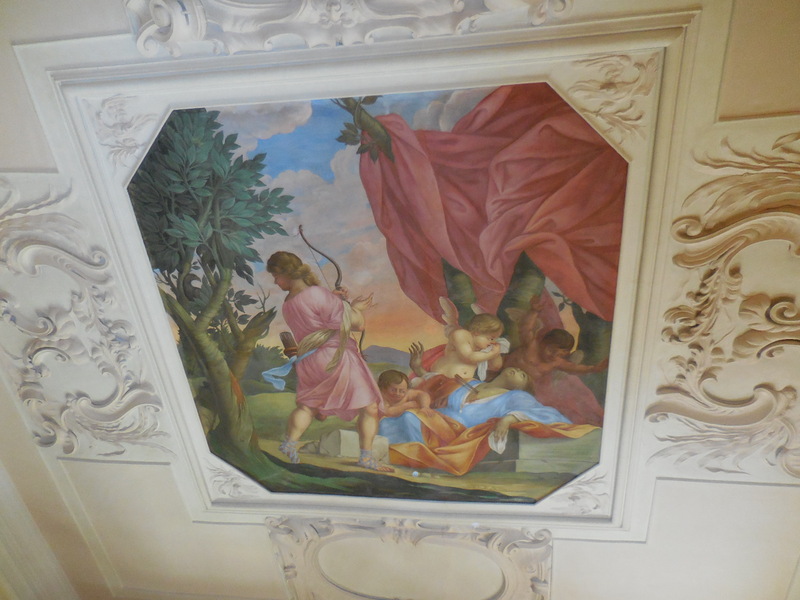 The ceiling fresco in the first room was breathtaking, displaying a mythological scene. A Renaissance chest gilded with ivory and a Baroque jewel chest inlaid with ivory and tortoiseshell were two delights. 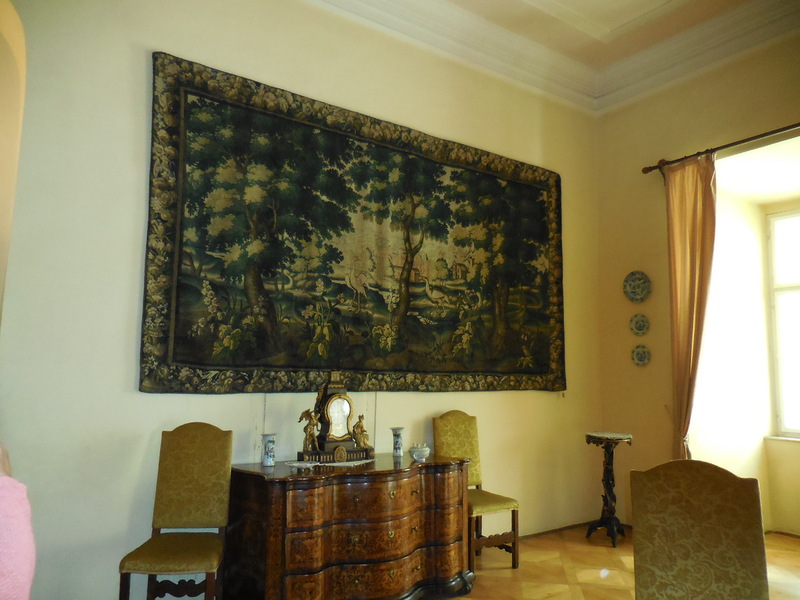 I marveled at the tapestry, one of many I would see in this chateau, in the Big Gallery. It dated from the 16th century, and its theme was the Trojan War. 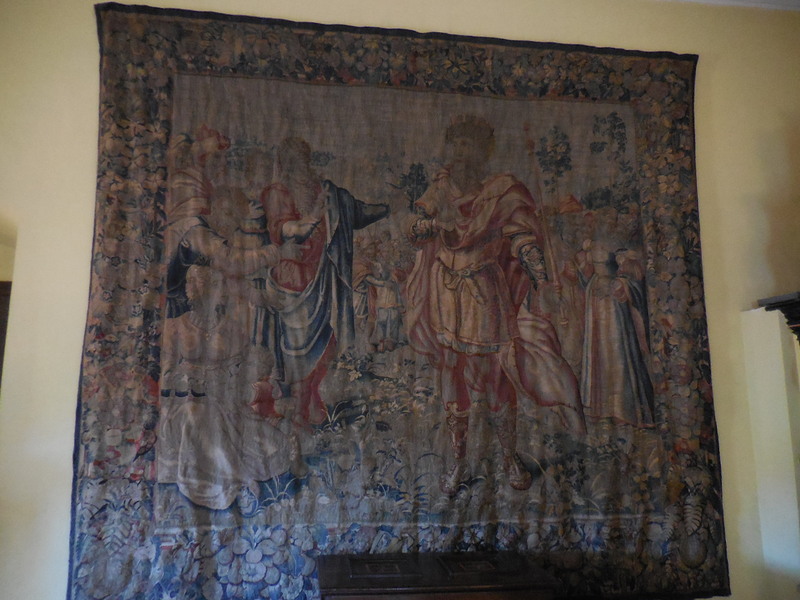 The guide remarked that the tapestries were not put up for merely for show; they had also helped heat the rooms. 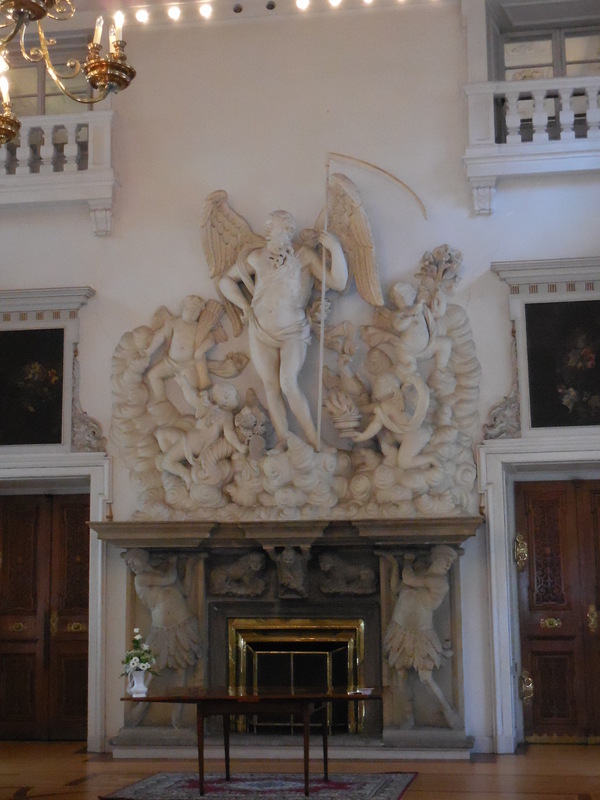 A Baroque fireplace hailed from 1620. Still, that was not all this room had to offer. A jewel chest featuring carved reliefs hailed from the beginning of the 17th century. The Study included an atlas from 1775 with pages of handmade paper. I wanted to turn the pages to find out what the handmade paper felt like. I recalled visiting the papermill in Velké Losiny, located in north Moravia, long ago, when I also toured the chateau there. It had been an enthralling experience, I mused. Then a jewel chest made with intarsia dazzled me. One tapestry in this room showed off a garden party while another sported a plant motif in an idyllic setting. The Baroque stove hailed from 1690. There were so many impressive Baroque stoves in this chateau! During the 17th and 18th centuries in the Czech lands, there was much interest in Chinese and Japanese porcelain. The Chinese and Imari Japanese vases in the Oriental Salon reminded me of a trip to Dresden’s Porcelain Museum. The pieces in the chateau were so exquisite. Upon seeing an impressive French Baroque clock, I recalled the one I had seen at Loučeň Chateau a few months earlier. And how I loved jewel chests! This particular jewel chest was inlaid with ivory and tortoiseshell, featured intarsia craftsmanship and portrayed a hunting scene. Another thrilling tapestry was on display. 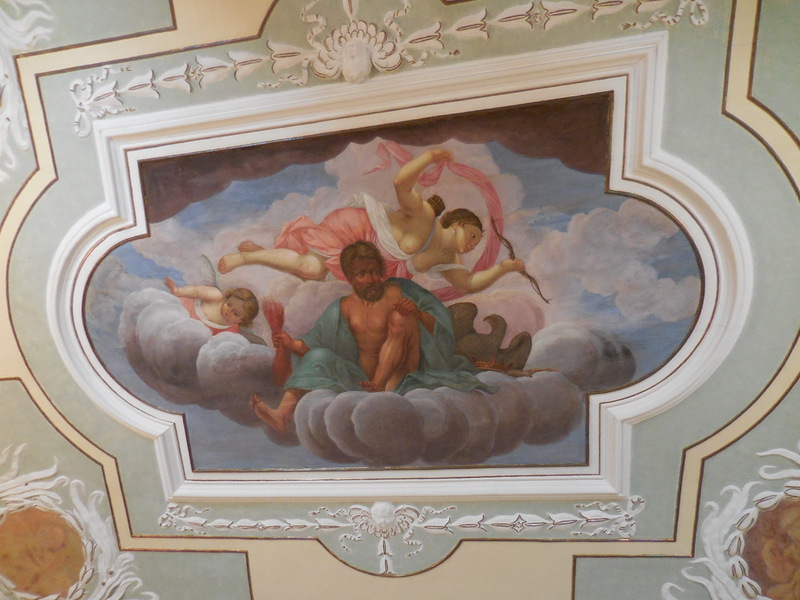 I recalled the exciting tapestries at the Residence Palace Museum in Munich. In the Bedroom I admired the spiral carved columns of the 17th and 18th century Baroque closets as well as the bed with canopy. A Rococo crucifix was also on display. The tapestry in this room featured King Solomon. I was enthusiastic because I knew there were even more tapestries to come. Rococo furniture from the 18th century decorated the Morning Salon. 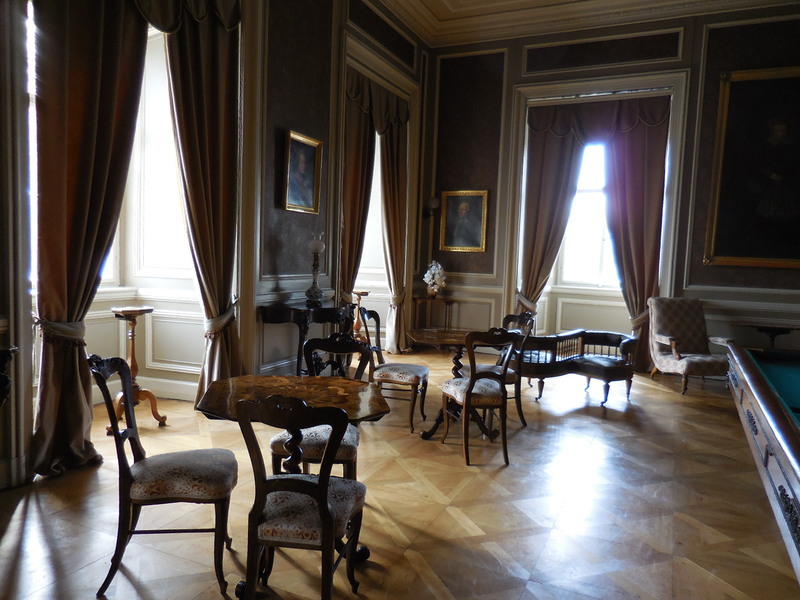 I mused that it must have been delightful to sit in this room and sip black or green tea. Two tapestries portraying the apostles adorned the space. 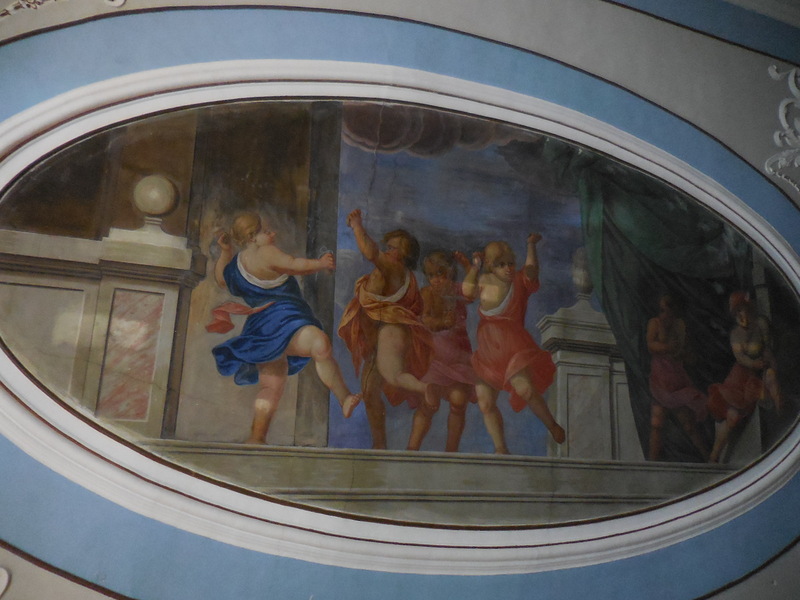 And there was yet another ceiling fresco! This one showed Persephone venturing into the Underworld. I was especially drawn to the jewel chest with pictures of a town carved on its drawers. The attention to detail fascinated me. In the Ladies’ Cabinet there was a Baroque commode with exquisite intarsia plus a Rococo table and desk also created with intarsia. The three tapestries took up themes of nature and architecture, offering a respite from the religious scenes that the tapestries often portrayed. The Men’s Cabinet was decorated mostly with Neo-Renassaince and Second Rococo furniture. A large desk was Baroque. If I had not visited so many chateaus, it would have never occurred to me that the big bowl decorated with images of birds and floral motifs used to serve as an aquarium. 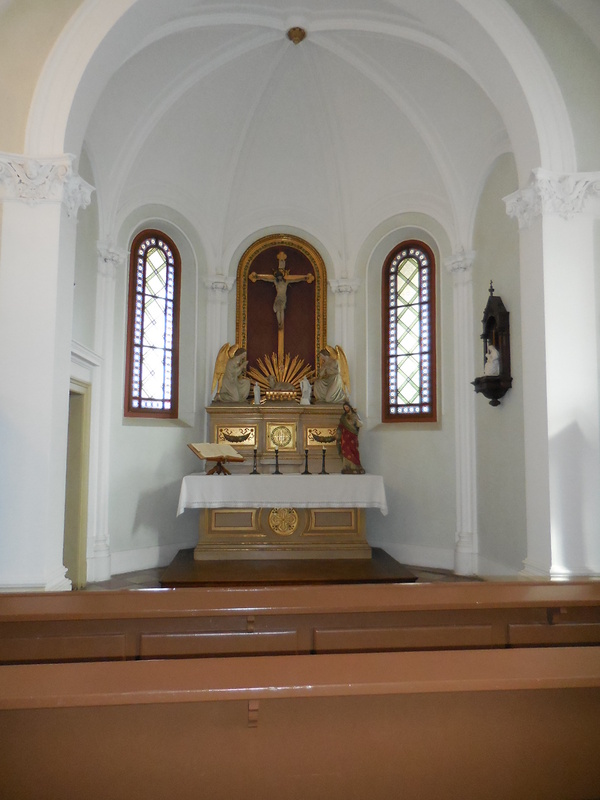 Next came the chapel. While it was originally designed in Gothic style, the chapel now looks as it did after a 19th century renovation. I admired the stained glass windows. I love stained glass! The Neo-Gothic altar featured the apostles. 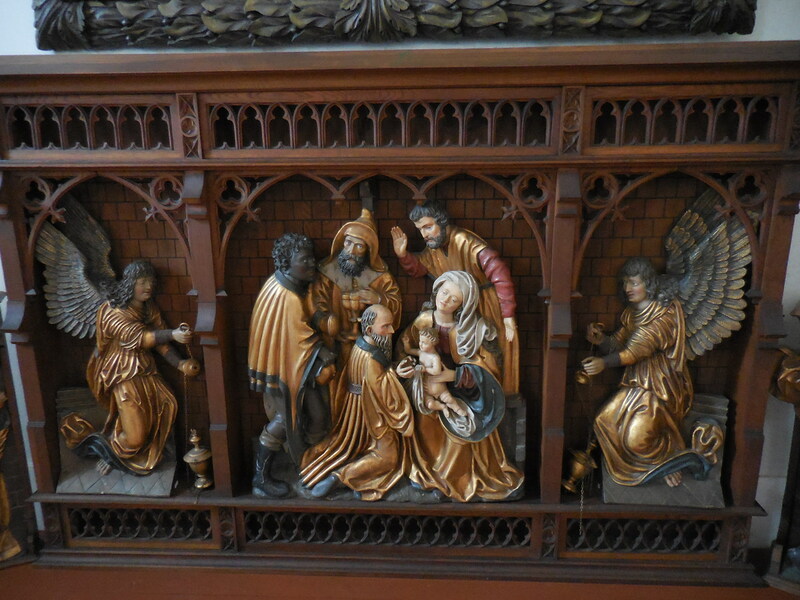 What captured my attention the most, however, was a 16th century exquisitely carved altar showing off the adoration of the Three Kings. The woodwork was incredible, so detailed, so exquisite. 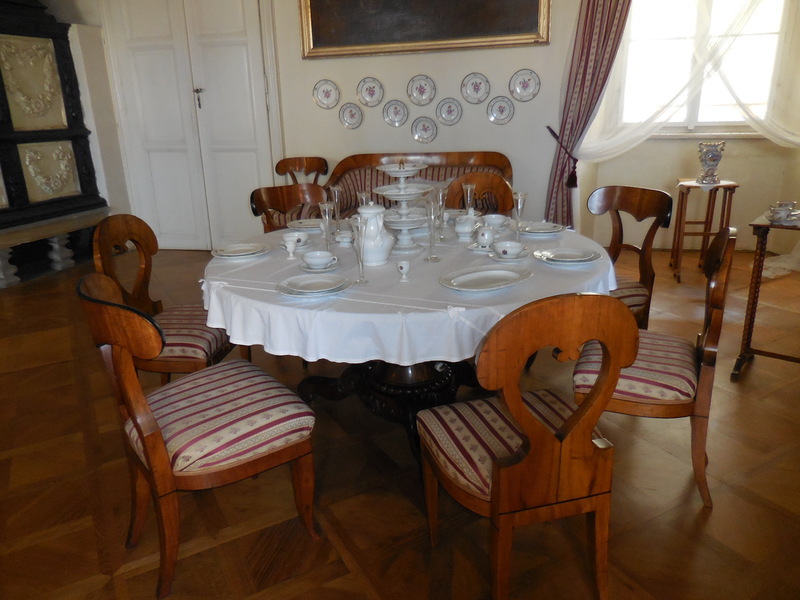 I liked the Biedermeier furniture in the Small Dining Room. That style seemed to me to have such a sense of order and rationality. Yet I was enthralling by all styles of all eras. The colored decorative porcelain from Dresden and the pink-and-white Viennese porcelain service also caught my eye. The Baroque stove was quite a sight, too. 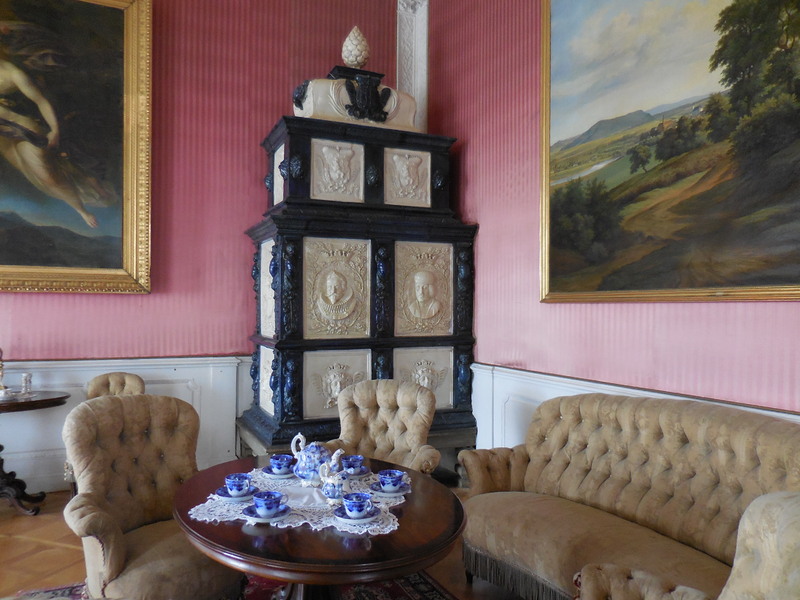 The Rococo Salon featured furniture of the Second Rococo style from the mid-19th century. The pink walls made the room feel quaint and inviting. 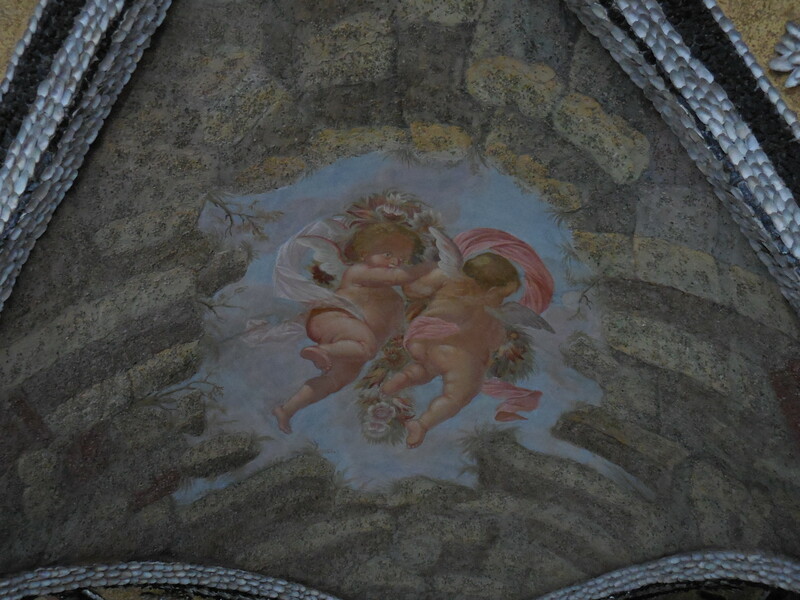 Stucco adorned the ceiling fresco. 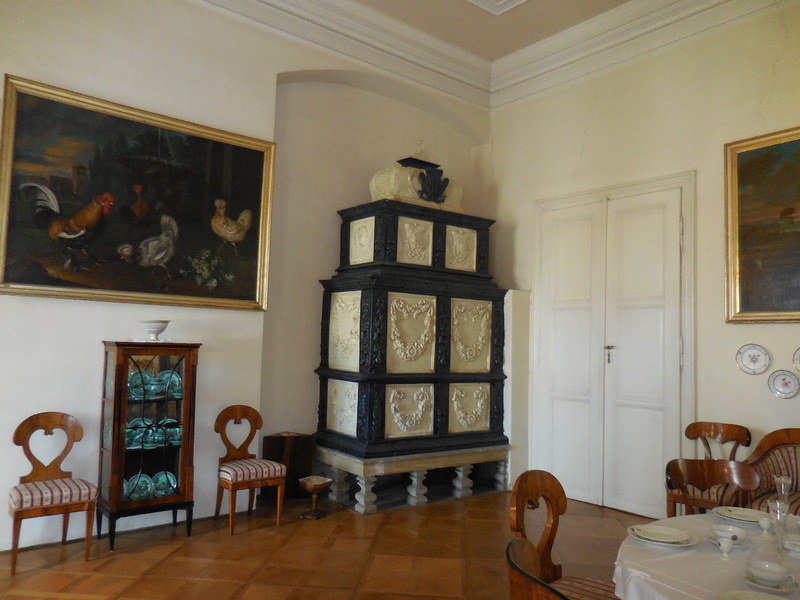 Another Baroque stove and Meissen porcelain made appearances. In a flattering portrait, Terezie Dietrichsteinová – Herbersteinová, a former owner of the chateau, looked calm and content with life. I wondered if I was at a time in my life when I was calm and content. To some extent, yes. And traveling certainly played a major, positive role in my contentment. The Empire Salon was decorated with furniture of that style from the 19th century. On the walls were pictures of Dietrichstein properties – Nové Město nad Metují Chateau, Kounice and Mikulov, all rendered masterfully by František Kučera. I liked the clock featuring a tongue that showed the time. The clock making time with its tongue brought to mind images of the living objects in The Beauty and the Beast. From the window there was a splendid view of the park. 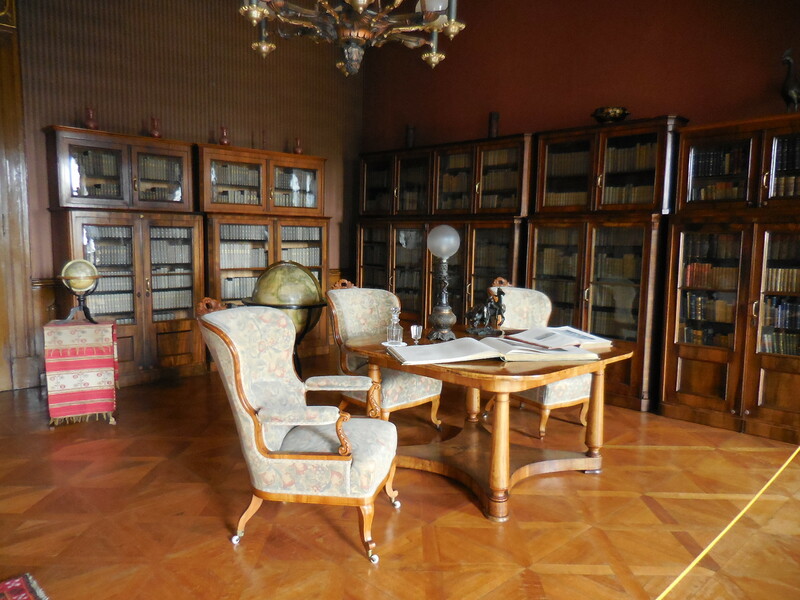 The 19th century library was intriguing because it contained mostly books about natural science and travel, all printed in numerous languages. I had not heard of chateau libraries concentrating on only a few subjects. While about 2,500 books were on display, there were approximately 6,000 volumes in total. Objects that Josef Herberstein had brought back from his travels adorned the room, too. I saw African masks, an African crocodile and a Japanese sword, for instance. Another exquisite Baroque stove stood in the space. The last room was the casino. A Russian pool table made in Prague dominated the room. I noticed that the card tables were made with intarsia. 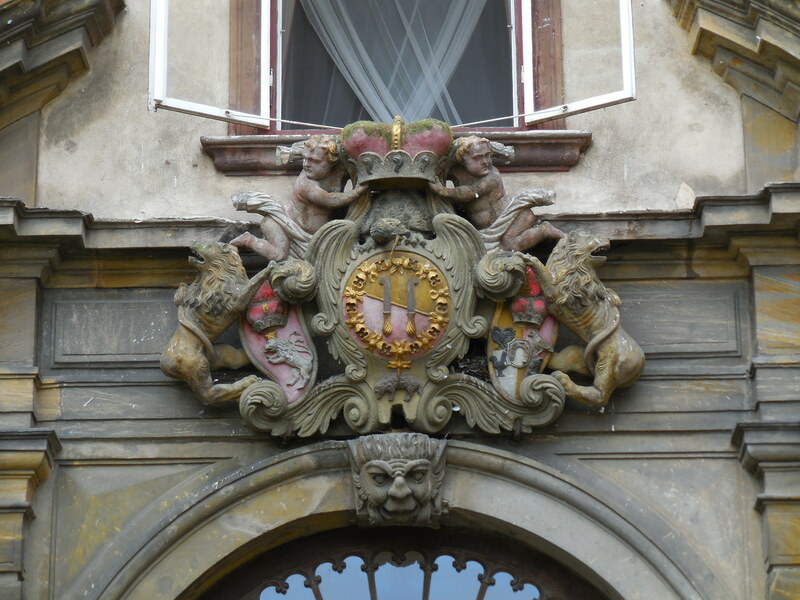 Portraits of the Dietrichstein clan hung on the walls. Josef, who loved traveling and hunting, was rendered in hunting attire, armed with a rifle and accompanied by a dog. I mused that he must have been a brave man to travel to such distant lands. 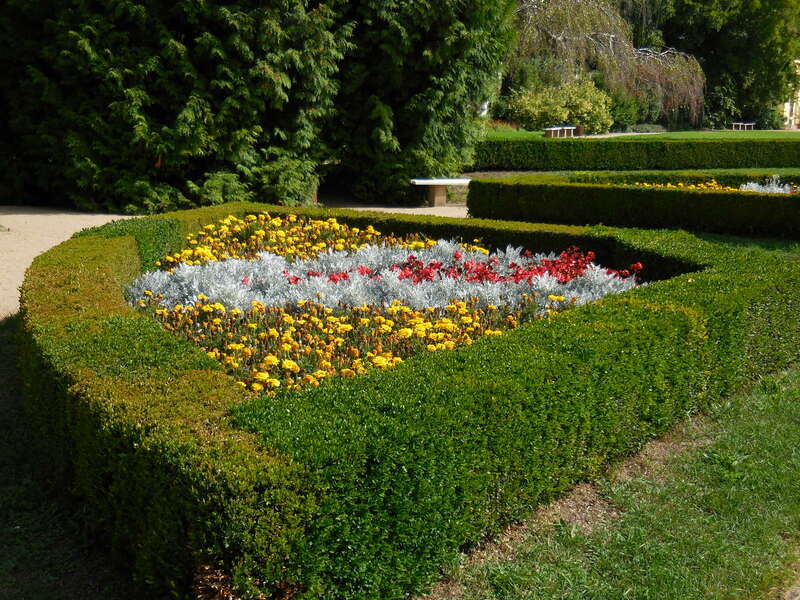 Next I took a look at the park, which had been created in French style during 1683. Later, it got a Baroque makeover, and then it was changed into an English park. Now it is once again in French style, thanks to 20th century reconstruction. I loved the view of the chateau from the back, which sported floral adornment and a fountain. The chateau looked so majestic when viewed from that area. I ate lunch at a nearby restaurant on the main square that was sleepy on a Saturday afternoon. Libochovice Chateau had dazzled me once again. The combination of ceiling frescoes, Baroque stoves, jewel chests and tapestries made the chateau unique and irresistible. 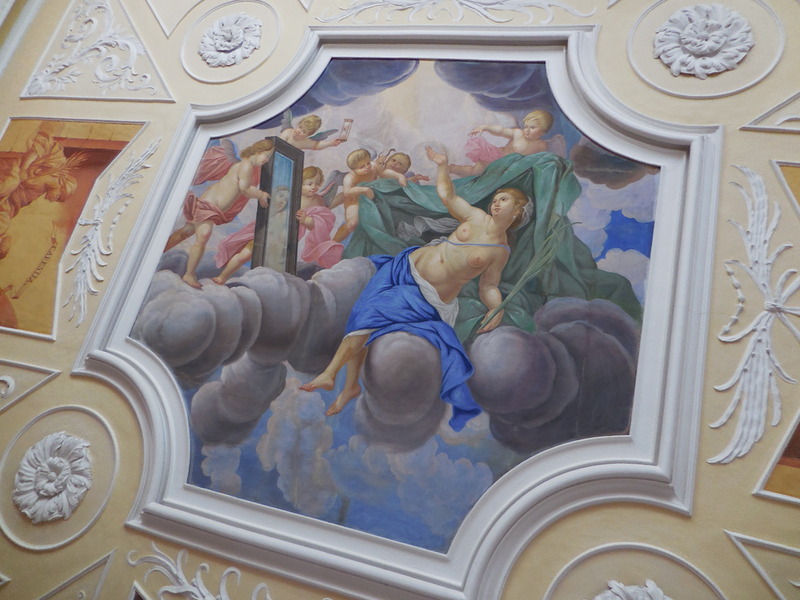 The paintings also contributed to the majestic interior, where no object or piece of furniture failed to enthrall. The interior had plenty to offer. I mused that there should be tours of the chateau offered from Prague. Libochovice deserved numerous accolades, and it was a chateau I would never forget, no matter how many chateaus I visited. The combination of artifacts and the design of the interior made Libochovice unforgettable, a place I could tour 100 times and not be bored. Every object spoke to me; nothing failed to capture my interest and curiosity. Yes, Libochovice is a special place, and my visit made my day a huge success.